Lexica are only as strong as the properly analyzed corpus on which they are based, and the best lexica give examples for lemmata and sublemmata. One advantage among many of electronic lexica is the possibility of pointing to an almost unlimited number of examples from the corpus to illustrate the meaning in question. Due to size, printed dictionaries must limit the number of examples they give, but, of course, well-chosen examples, even if few, may still serve their purpose well. The large (and expensive) Georgian dictionary of Sarjveladze and Fähnrich (Altgeorgisch-Deutsches Wörterbuch, HdO 8.12 [Leiden: Brill, 2005]) might be even better with more examples, but it already strains the limits of maneuverability for a 8º with more than 1600 pages, and that’s with very minimal margins, something unfortunate for a printed dictionary (or printed books of other kinds, too). Still, the examples, all of which are translated into German, are well chosen: while it may not be your choice for a desert-island book, the examples are instructive and at times, depending on the present mixture of your humors, entertaining. Below is an example I recently stumbled upon while hunting for another word. The line is cited from S-1463 264v and appears in the dictionary on 259b, s.v. გარდმოქართულება “to translate into Georgian”. From Greek he has translated into Georgian these chapters brought to light by the Armenians. გარდმო-უ-ქართულ-ებ-იან perf. 3p, the CV -უ- marking a 3rd pers. IO (the logical agent from the perspective of some languages), with the usual structure of Old Georgian Series III verbs. In the course of cataloguing the Syriac manuscripts belonging to the collection of the former Chaldean Church in Mardin Adam McCollum discovered an old folio that had been re-used as an endpaper to strengthen the binding of Mardin Chald. 89, a much later manuscript. The folio contains two columns of text in a neat estrangelo hand that should probably be dated to the ninth century. He kindly sent an image of the folio to me in case I might be able to identify the contents. It is not always easy to date estrangelo hands, especially those that are more conservative in character. 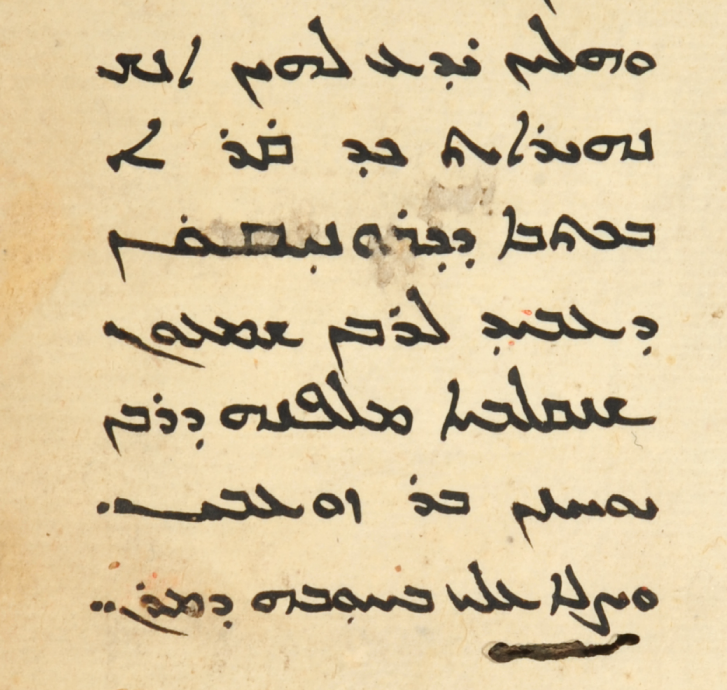 After comparing the hand with the photographs of dated manuscripts in Hatch’s invaluable Album of Dated Syriac Manuscripts, it became fairly clear that the script on the folio was likely to date from the ninth century. Having transcribed a certain amount of the text, in so far as it was legible, it turned out that it contained a number of place names, including ‘Byzantium’ and ‘Europe’. These names, and the general ‘feel’ of the text, strongly suggested that the work it contained was a translation from Greek. The next clue was the presence of some marginal glosses in what was clearly a much later hand; this indicated that it was a work that still continued to be read and studied several centuries after the date of the original manuscript. It so happens that after about the ninth century many translations of Greek patristic authors fell out of fashion and were no longer copied or studied. One of the small number of Greek authors who did remain authoritative and studied was Gregory of Nazianzus, and so his writings, and in particular his Discourses, seemed a good place to start on the hunt for references to ‘Byzantium’ and (especially) ‘Europe’. Fortunately most of the Sources chrétiennes volumes containing editions of the Greek text of the Discourses are provided with indexes of names, and it soon turned out that the folio did indeed belong to one of Gregory’s Discourses, namely his funeral oration on his brother Caesarius (Discourse 7 in the Greek numbering; the Syriac numbering is different). Actually the name ‘Caesarius’ turned out in fact to occur on the folio, but the writing was damaged at that point, with a key letter obscured. Having located the passage (at the end of section 8 and beginning of section 9 of Discourse 7), it was now important to establish whether the translation belonged to the original translation of Gregory’s Discourses, or to the revision by Paul, bishop of Edessa, made in 623/4, where he had taken refuge from the Persian occupation of his see. Whereas several manuscripts of Paul’s revision survive, none of the original version are known. 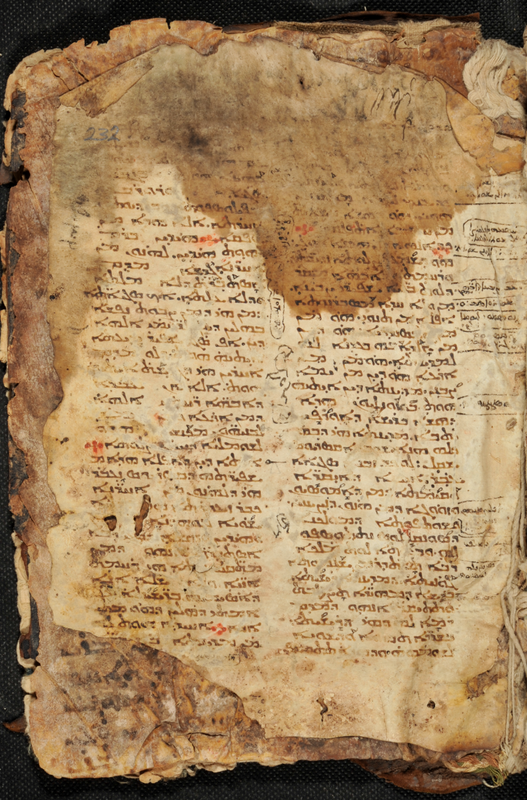 In order to establish to which version the folio’s text belonged it was necessary to pay a visit to the rich collection of Syriac manuscripts in the British Library, which fortunately includes a number of the relevant manuscripts. A comparison of the folio’s with two of the earliest manuscripts of Paul’s revision (Add. 14,548 of 790 and Add. 12,153 of 844/5) quickly established that the text on the folio must belong to the revision, and not to the lost original. The Syriac version of Gregory of Nazianzus’ Discourses (in both forms where available) is currently gradually being published as part of the Corpus Nazianzenum by scholars at the Université catholique de Louvain-la-Neuve, and so far (2001-) five volumes have appeared , covering eleven Discourses: Versio Syriaca I (J-C. Haelewyck) = Discourse 40; II (A.B. Schmidt) = 13 and 41; III (J-C. Haelwyck) = 37-39; IV (J-C. Haelewyck) = 28-31; V (J-C. Haelewyck) = 1-3. Below is a simple sentence from the work known as The Capture of Jerusalem by the Persians in 614, by Antiochos Strategos (bibliography here). The Georgian version was first published by N. Marr in 1909 based on two manuscripts (Jer. 33 and A-70), but another copy (Bodl. Geo. 1) was discovered thereafter, and so the text was again edited and translated (into Latin) by Gérard Garitte as CSCO 202-203, and the Arabic version (two recensions) later appeared with a translation by the same scholar’s pen as CSCO 340-341, 347-348. Before Garitte’s work, excerpts of the Georgian text were translated into English and German by Conybeare and Graf, respectively. ვაჲ ბოროტისმოქმედთა და რომელნი მახლობელ მათა იყვნენ. Vae malefactoribus et iis qui propinqui illis erunt! This short example may be worth memorizing: you never know when you’ll need to say, “Damn the malefactors &c.” in Old Georgian! Graf, Georg. ”Die Einnahme Jerusalem durch die Perser 614 nach dem Bericht eines Augenzeuger.” Das Heilige Land 67 (1923): 19-29. Peeters, Paul. ”De Codice hiberico Biliothecae Bodleianae Oxoniensis.” Analecta Bollandiana 31 (1912): 301-318. ________. ”Un nouveau manuscrit arabe du récit de la prise de Jérusalem par les Perses en 614.” Analecta Bollandiana 38 (1920): 137-147. ________.”La prise de Jérusalem par les Perses.” Mélanges de l’Université Saint Joseph 9 (1923-24): 1-42.